An East Coast favorite, a raspberry lime rickey is a summer must. 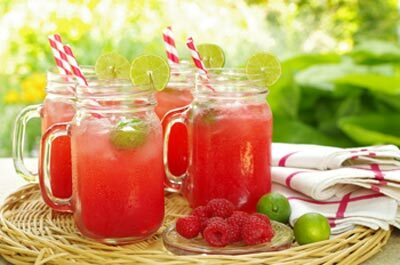 Sweet-tart raspberries are paired with fresh lime flavors enjoyed in a glass generously filled with ice. Sparkling water tops off the experience with a refreshing fizz. Directions: Puree the fresh raspberries and strain into a large pitcher. Add the simple syrup, freshly squeezed lime juice, and stir. Pour the concentrated mixture into 4 glasses filled with ice. Top off each glass with seltzer water until full. With a long teaspoon, stir each glass gently. Squeeze two halves of a key lime into each glass. Garnish with a lime slice and straws. Remember Orange Creamsicles®? Those wonderful frozen pops that had vanilla ice cream on a stick encased in a sweet orange shell? This drink recreates those flavors with fresh ingredients. Directions: Juice the oranges. Chill (or start with chilled oranges). Divide the juice equally into 4 soda fountain glasses. Add a 1/2 cup of seltzer water to each glass or enough to fill the glass 3/4-full. Add a dollop of your best vanilla ice cream. Serve with straws and a spoon. 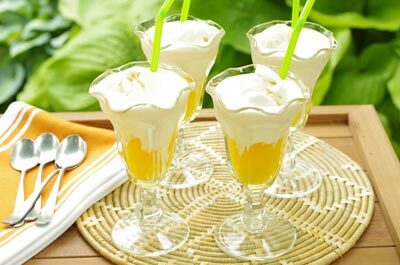 Variations: Sparklers, or ice cream floats have been a long-time favorite since the soda fountain days. Soda fountains are nearly extinct, but not the ice cream float. Try a “brown cow” with root beer, chocolate syrup, and vanilla ice cream. Or, cherry cola with vanilla ice cream. A sweet old-fashioned treat! Adult Version: An orange sparkler becomes a little more special when a Mimosa twist is added. Substitute champagne or a sparkling wine for the club soda. The tropical regions know a little something about staying cool in heat. Local fruits mixed with ice provide cool comfort during afternoon heat. A piña colada is but one tropical favorite. Our version crushes ice along with the fruits transforming them into a refreshing slushie. Directions: Prepare the fresh pineapple by removing the top, bottom and outer skin. Cut the pineapple in quarters lengthwise. Cut away the tough inner core. Dice the remaining pineapple flesh. Place the pineapple, cream of coconut, and ice in a blender (one approved for ice crushing) and process until smooth. Serve immediately. Variations: Slushies are especially refreshing on warm, humid days. Test your skills with a Strawberry Slushie: 2 cups of sliced strawberries, juice of one lemon, 3 tablespoons simple syrup and 2 cups of small ice cubes. Adult Version: Piña Coladas are best known as rum-based cocktails. It makes sense, pineapples, coconuts, and rum are all local ingredients in Caribbean regions. In fact, the piña cola is the official beverage of Puerto Rico. Add light or dark rum to this mixture for a cocktail version. Juicing fruits and vegetables makes the most of fresh harvests. For many, juicing provides an easy way to incorporate more healthy nutrients into their diets. This green version uses only grapes and apples for a natural answer to sweetening. Directions: Prepare the fruits and vegetables as noted. Place all of the ingredients in a blender or food processor and process until smooth. Chill (or begin with chilled ingredients). Variations: Juicing fruits and vegetables offers endless variety. When combining ingredients, consider what type of drink you would like, sweet or one more savory. Pair bland ingredients with stronger flavors; use fresh herbs to bring additional personality. Grapes and apples always offer a lot of natural sweetness, while citrus brings brightness. 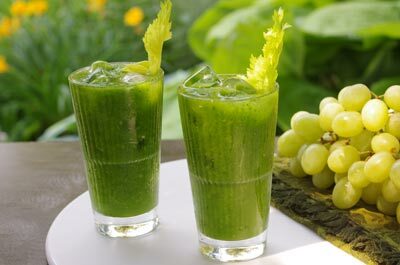 Adult Version: Move over “Bloody Mary!” The above combination of fruits and vegetables becomes a “Green Greta” when vodka is added. Not a bad “hair of the dog” or brunch choice. Add melon liqueur for a sweeter cocktail. Blueberries have one of the highest antioxidant values – they’re health! And, this time of year, they are abundant. 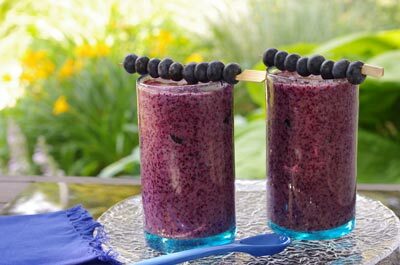 Transform your beverage into a meal by pureeing blueberries, and a banana with vanilla yogurt. Add a few granola crunchies on top and call it breakfast. Directions: Place all ingredients in a blender or food processor and process until smooth. Serve immediately. Variations:Vanilla yogurt provides an easy base for any flavor of smoothie. It provides a natural sweetness and thickness that complements so nearly any fruit. Other seasonal fruits this time of year include stone fruits – peaches, apricots, nectarines, and others. Adult Version: Fruit smoothies, in adult form, involve doubling or tripling the berries, substituting seltzer water for the yogurt, and adding vodka and your favorite fruity schnapps. The best flavors emerge when several kinds of berries are combined and the mixture brightened with tangy juices (lime, lemon, or unsweetened pineapple juice). It’s a surprisingly delicous and refreshing taste. But what is a shrub? It’s a beverage that derives its flavor from fruity vinegar. Sweetened, muddled fruits are fermented into vinegar, then used when mixing beverages. Our version is really a pseudo-shrub. We’ve used a ready-made fruit vinegar in our concoction. It’s a different type of refreshment! Directions: Smash or puree half of the blackberries and strain. 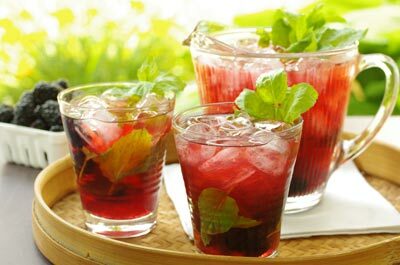 Mix 4 teaspoons of the blackberry puree with the vinegar and simple syrup, and stir. Add several springs of mint to each glass and muddle (crush and bruising the leaves). Divide the concentrate into 4 glasses – about 3-4 tablespoons per glass. Fill the glasses with ice, and add seltzer water to fill. Stir each glass gently. Add several whole blackberries and more mint sprigs as garnishes. Variations: Experiment with different vinegars and fruits. Champagne vinegar pairs very nicely with raspberries and presents with a lovely clear pink color. White balsamic vinegar has a more subtle flavor and a color that matches well with a number of fruits. Adult Version: To turn this Blackberry Shrub into a cocktail, add vodka, gin, or rum. If you prefer a slightly sweeter cocktail add a flavored liquer such as framboise to the glass.